The Palo Santo tree is a medium-sized tree found along the forest edges of the Canal area and Pacific lowlands of Panama. Growing up to 20 meters in height, it has a straight trunk with small buttresses. Its creamy brown outer bark peels to leave patches of the light inner bark exposed. Its leaves are simple and alternate in arrangement, regularly spaced along branches, and have prominent parallel veining. Palo Santo is dioecious, meaning that male and female reproductive structures develop on different individuals. The masculine “staminate” flowers are tiny, whitish to greenish and are arranged on long stalks above the crown. The feminine “pistillate” flowers are approximately 5 cm long, a very showy red or pink. The fruit, produced by the pistillate flowers, is yellowish brown, and has three reddish wing-like sepals. Fruits are dispersed by the wind. 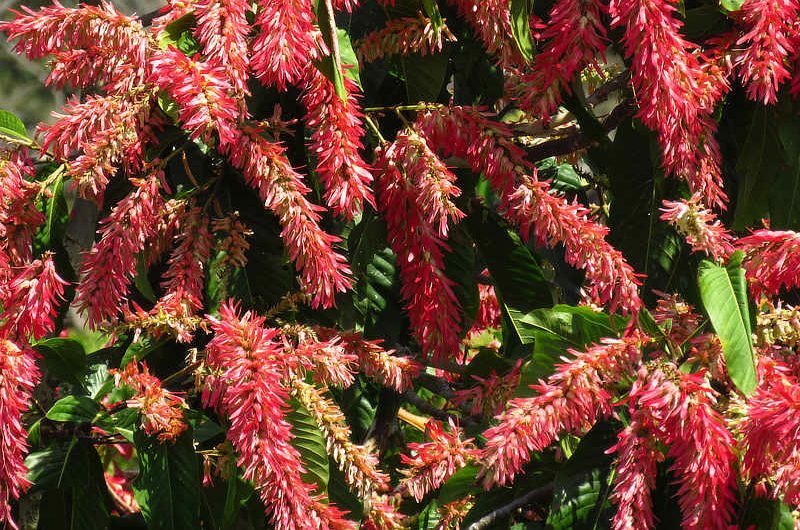 The female tree therefore is showier due to its colorful flowers, and makes this species very recognizable. Palo Santo flowers in February to April, and the fruits ripen in April and May. The branches of the Palo Santo tree are hollow, and are most often inhabited by ants Pseudomyrmex triplaridis, aggressive ants with powerful stings. Tapping the branches or saplings often results in the ants coming out in view. For this reason, the Palo Santo is also known as the “Ant Tree.” It is occasionally cultivated as an ornamental, and the wood is used in the construction of open-air huts. Palo Santo is found from Costa Rica to Ecuador and Peru, and the beautiful flowery crowns of the female trees are enjoyed right outside the windows of the Canopy Tower during Panama’s dry season.